Is art criticism a worthwhile endeavor in Trump’s America? 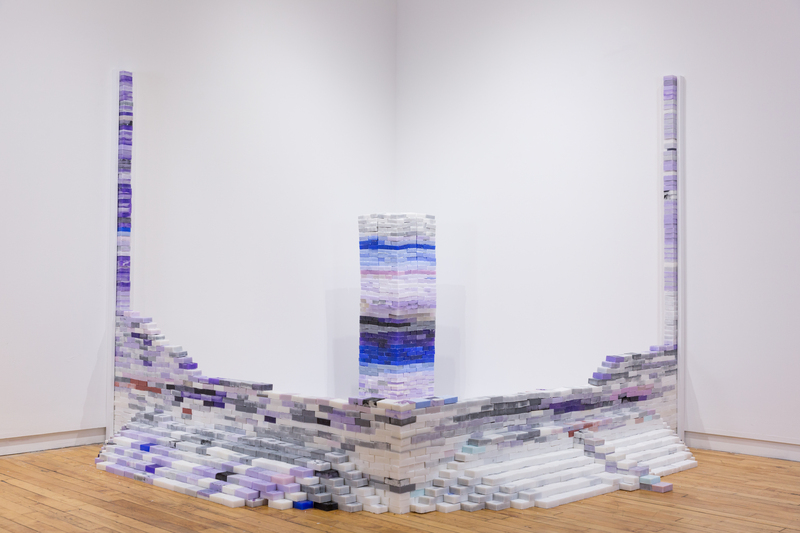 If the aim is to highlight work as visually and intellectually stimulating as Latham Zearfoss’ solo show at Andrew Rafacz Gallery, then there’s hope for it yet. There’s a lot to unpack here: artistic practice versus the commercial art world, how one person’s freedom can be another’s prison, to an imagined conversation between Judith Butler, gender theorist, and Octavia Butler, science-fiction writer. The first room of the gallery mimics a department store. A row of flat-screen televisions, descending in size, sit atop pedestals covered with poured paint. 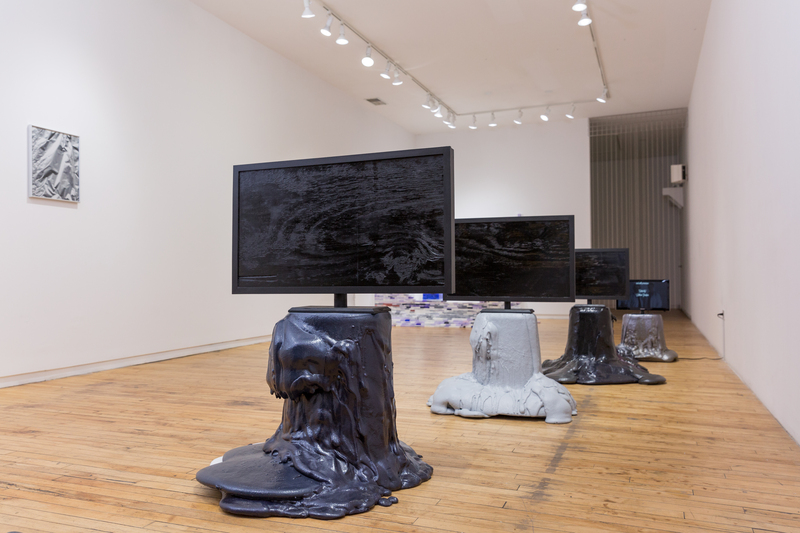 Black, white, grey and blue paint ooze around the bases of the sculptures, aptly titled “Sculptural Object To Put A TV On.” The smallest television is also the only functional one; the others are covered in paint and lacquer. On it plays “The Butlers Did It,” a video showing stock footage of a black woman and a white woman in a hospital. Two Chicago artists provide voiceovers for the characters, in the form of popular quotations from the works of Octavia and Judith Butler, taken from the website Goodreads. Zearfoss has brilliantly brought together these two progressive writers to unearth a hidden subtext through their subsequent conversation. Unfortunately when I visited I couldn’t hear the dialogue, as another video piece, “Dirge,” had overwhelmingly loud audio. In the back gallery, this work is projected onto a wall. It shows a creaking, riderless escalator at the Fullerton CTA station. 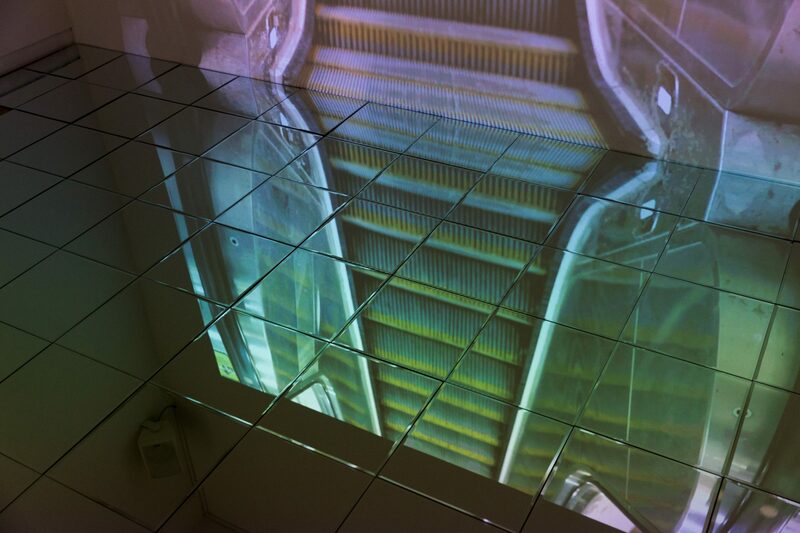 Mirror tiles are laid in a pyramid on the floor in front of the video, reflecting the larger-than-life escalator ascending on an infinite loop. Zearfoss has taken the audio of the scene and mixed it with singers mimicking the machines’ notes, making an intense choral effect. A dirge expresses grief, so it makes sense that the audio permeates the show. “Dynamite,” located in the first room, is composed of another poured-paint pedestal. This one holds eighteen birthday candles tied in a bundle with twine. The piece is meant to celebrate the life of Laquan McDonald, the Chicago teenager killed in October 2014 by Chicago Police officer Jason Van Dyke. McDonald didn’t live to see his eighteenth birthday. He was shot sixteen times, in a period of fifteen seconds. “Dynamite” is an elegiac reminder.